Is it time for the Federal Reserve (Fed) to stop printing money? Today, we focus on what might be going through Fed Chair Bernanke’s mind and the possible implications for the U.S. dollar and investors. This week, the casual observer could come to the conclusion that the Fed wants to phase out printing additional money. The Federal Open Market Committee (FOMC) Minutes to be released this Wednesday might strike a comparatively optimistic tone. The only caveat being that the FOMC meeting statement included the language: “The Committee continues to see downside risks to the economic outlook”1 which may be elaborated on in the Minutes. Since then, even historically dovish2 members of the FOMC have presented a view in public speeches that the Fed might gradually phase out printing more money. This suggests that the Minutes will have a broad discussion of such a gradual “exit,” even if a phasing out of additional monetary easing can hardly be characterized as such. Later in the day on Wednesday, two “hawkish” Fed Presidents are scheduled to give speeches. Taken together, investors might be excused to think an “exit” might be coming closer. But in many ways, those Minutes are rather dated. Most notably, last Friday’s payroll report suggested the economy may be sputtering once again. That, in turn, suggests the printing press should keep running at high speed. 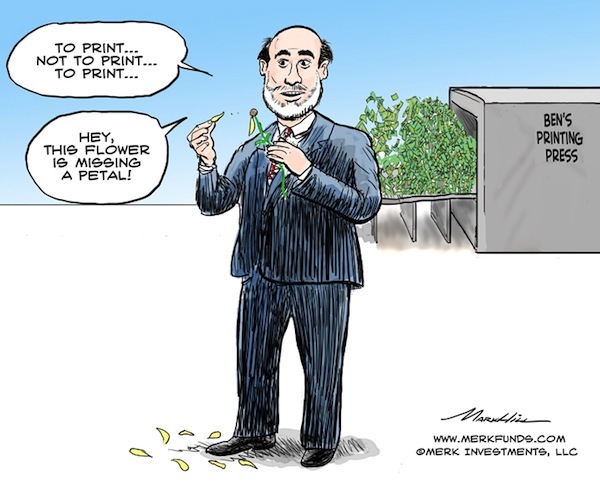 “Printing” is figurative, as the Fed creates money out of thin air, through the stroke of a keyboard, crediting the accounts of large banks in return for buying Treasury and Mortgage Backed Securities (MBS). Will the printing presses in the rest of the world influence the Fed back home? Not reflected in the Minutes is the new era in Japan, where the Bank of Japan has promised it will do “whatever it takes” to beat deflation (for an in-depth look on Japan, including our prediction that the yen will be worthless, please see our recent analysis “Monetary Madness in Times of Unsustainable Deficits”. Also keep in mind that in the not-too-distant future, Mark Carney will take the reins at the Bank of England, likely introducing a higher inflation target and/or nominal GDP targeting. With Japan greasing the wheels, the Fed might be inclined to be less generous. Indeed, the Fed has applauded Japan’s monetary largesse, possibly because it provides the Fed cover for its own actions. It’s a relief for Bernanke, who in recent times had to look with frustration at Europe, where mopping up liquidity is the modus operandi: correct, the balance sheet of the European Central Bank (ECB) has been shrinking of late, as ECB loan facilities are less in demand. The ECB’s relative frugality is a key reason why the Eurozone has been experiencing so much strain, as countries actually have to try to fix their problems rather than rely on free money to continue with unsustainable habits. Ultimately, while the Fed does get concerned when strains in the rest of the world risk affecting the U.S., the Fed is primarily concerned about the U.S. economy. And within the U.S. economy, Bernanke is foremost concerned with the housing market. In our reading of Bernanke, he strongly believes that as long as millions of homeowners are underwater in their mortgage, consumers will be reluctant to spend. To fix the problem, consumers could downsize to homes they can afford (read: foreclosures, bankruptcies); could pay off their debt (good luck on that one with real wages not going anywhere); or, alternatively, and this is where the printing press can be of help, the Fed can help push up price levels. At the same time, Bernanke’s worst fear appears to be a premature tightening; he has indicated on many occasions his conviction that the biggest policy mistake during the Great Depression may well have been that interest rates were raised too early. Trouble is that, historically anyway; the market is in charge of longer-term interest rates (the “long-end” of the yield curve). To contain the long-end of the yield curve the Fed has: promised to keep rates low, purchased longer dated Treasury Bonds and MBS, engaged in Operation Twist, and finally inched from a focus on inflation to a focus on unemployment. All of this, in our assessment, to prevent the bond market from selling off should economic growth pick up. Indeed, we believe the biggest threat we are facing might be economic growth, as it puts the bond market at risk. A key looming problem: questions about the sustainability of US government debt will rise as long-term interest rates rise. But for the time being, the economy may be sputtering once again. So, in a nutshell, an “exit” is, in our assessment, off the table in the short-term. No matter what the FOMC Minutes are going to say. In the medium-term, Bernanke is hoping that Japan’s monetary easing, even if contained to government securities, will encourage Japanese private investors to buy government bonds overseas to make his own life easier. For now, the price of gold appears glued to the Fed “exit” question. But as we believe there is too much government debt in the developed world, we expect the Fed, BoJ and BoE to continue printing money on a grand scale. As we move on to new stages, the price of gold may once again become a good reflection of where we are heading. Incidentally, during the peak of the Eurozone crisis, of the major currencies, the euro had the highest correlation to the price of gold; few gold bugs would have wanted to hold the euro as a substitute for gold, but to the casual observer, their price movements had a lot in common. Of late, gold appeared to do well when the yen performed poorly - a price action that’s closer to the heart of gold bugs. The greenback itself has had a rough ride of late: giving up most of its gains for the year versus the euro as the ECB is structurally far less likely to deploy its printing press to fix non-monetary challenges, such as excessive government debt or an undercapitalized banking system. By the way, few may be aware that the euro was up almost 2% versus the dollar in 2012: that’s what the U.S. dollar was able to achieve during a period of great stress in the Eurozone. More broadly speaking, we have seen the U.S. dollar attempt to rally whenever there’s a crisis. I note “attempt” as it also appears that such rallies have become less and less pronounced. There may be two key drivers for this: first, the U.S. government’s balance sheet is deteriorating at a faster pace than the balance sheets in much of the rest of the world; and second, wherever there is a crisis, it is being patched up. That doesn’t make the rest of the world “safe”, but it may be perceived to be less risky than before the patch was applied. As such, when the pendulum swings towards risky assets, more money may be staying there. Having said that, it’s also not the same “risky” asset each swing of the pendulum; last August, when ECB head Draghi imposed a new process on the Eurozone (see our analysis Draghi’s Genius), money wasn’t flowing towards commodity currencies and precious metals, but into the euro. Should the FOMC Minutes trigger a rally in the U.S. dollar, it might provide a good opportunity to diversify out of the greenback. We will give an updated on specific currencies and gold in our upcoming analysis; please sign up for our newsletter to be notified. As we continue this discussion, we invite you to register to join us for our webinar on Thursday, April 18, 2013. 1The Minutes refer to the March 19/20 FOMC meeting, held a few days after the market confusion created by the proposal to "tax" insured bank deposits in Cyprus, ahead of the government's U-turn where, after some chaos, Cyprus backed off from the idea again. Despite the perceived turmoil, however, the market noted no "contagion", with Spain holding a very successful Treasury bill auction on March 19. Also note preceding U.S. unemployment reports had been rather positive. 2 "Dovish" FOMC members are considered those typically associated with policies favoring more monetary accommodation; in contrast, "hawkish" FOMC members are typically associated with policies favoring monetary restraint.